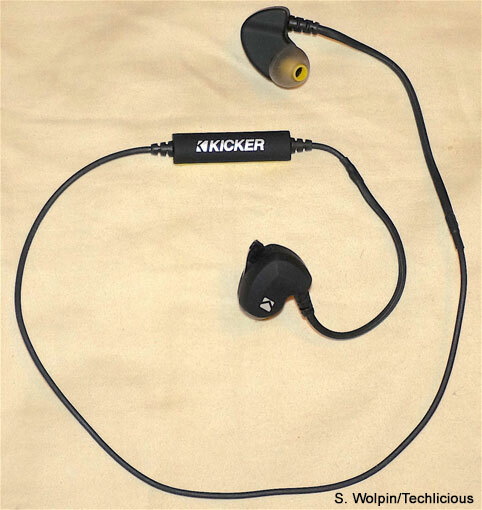 The Kicker EB300's unique combination of audio quality, fit, battery life, water resistance and price make them the best Bluetooth in-ear headphones. How you choose the "best" wireless Bluetooth in-ear headphones depends on how you're going to wear and listen to them. Are you a runner or gym rat that needs a sweat-resistant set of buds that will stay put in your ears, with plenty of bass to help pace your movements? Or, are you a daily commuter looking for an audiophile experience, long battery life and good conference call quality? As we researched and tested products to find the best Bluetooth in-ear headphones, we were looking for a pair that could satisfy users at both ends of this mobile music-listening spectrum. They needed to have good sound-quality—music with strong bass as well as good voice call quality. They had to be exercise-friendly, comfortable and fit well enough to stay put during vigorous workouts. And the battery had to last long enough to cover a workday. We narrowed the field to 13 contenders: Jabra Sport Pace ($79.99 on Amazon), Jabra Sport Pulse ($118.99 on Amazon), JayBird X2 ($149.00 on Amazon), Kicker EB300 ($79.95 on Amazon), LG Tone Pro HBS-760 ($45.02 on Amazon), LG Tone Ultra HBS-800 ($49.99 on Amazon), LG Tone Active HBS-850 ($72.99 on Amazon), LG Tone Infinim HBS-900 ($89.99 on Amazon), Motorola Surround ($33.99 on Amazon), Optoma NuForce BE6 ($120.93 on Amazon), Plantronics BackBeat Fit ($77.99 on Amazon), Samsung Level U ($53.96 on Amazon) and Sol Republic Shadow ($99.99 on Amazon). After days of testing, we picked the Kicker EB300. The Kicker EB300 offers a unique combination of music and conversation quality, comfort and fit, battery life, water resistance and price that makes them our all-round pick for the best Bluetooth in-ear headphones. Other than the Optoma NuForce BE6, the Kicker EB300 offered the widest soundstage and presence of all the headphones we listened to, and easily produced the boomiest base of the Bluetooth bunch. It ‘kicks’, hence the name of the company. For music listening, the Kicker’s present a thicker, less-airy tone, and you get a lot of bass. They don't destroy the midrange, as the tsunamic boom produced by the popular and pricier Beats, but the Kicker’s ‘kick’ was still a bit overwhelming to many of the vocals of my favorite dinosaur rock selections that lack modern mixing. As such, the Kickers’ pounding 'a plenty may appeal more to more modern millennial ears than those of boomers. On more 21st century material, including Adele's "Skyfall," Mark Ronson's and Bruno Mars' "Uptown Funk," the Black Eyed Peas' "Let's Get It Started" and several selections from Queen Bey's "I Am… Sasha Fierce," the Kicker still muffled a bit of the midrange but offered more bright "presence" than the other headphones we tested. In other words, a good, if boomy, sound. If you want Bluetooth buds with more even-tempered and airy quality, opt instead for the Optoma NuForce BE6. You get plenty of voice volume and clarity for clear conversations. But, there is no noise-elimination circuitry, so there will be a lot of "What did you say?" if you're trying to hold a conversation in a noisy or windy environment. In fact, that's how we tested all these headphones – on a cold and blustery winter night approximately 100 feet from a busy New York City intersection while chatting with one of Techlicious' editors. Comparatively speaking, the Kicker fell just below the middle of the pack of our test phones where unwanted background noise was concerned. For running/exercise, or if you want to be aurally aware of your environment, ambient noise leakage shouldn't be an issue. But if noise canceling for urban pedestrian conversation is a high priority, the noise-canceling LG Tone Active HBS-850 is your best choice. The Kickers are both sweat and water-resistant but not IP rated; if you're going to clean them, use a damp cloth, not running water. Instead of a pre-formed plastic hook, the cord turns into a twist-tie-like flexible cord that can be bent around your ear to get a customizable and unshakable in- and over-ear fit. I find this design far more comfortable than in-lobe "wings" or "stabilizers," which can make your ears feel as if they've been stuffed, or stiff over-ear hooks. We admit that this is subjective criteria. Overall, the Kicker's fit feels snug but not stuffed, and can withstand the most violent of workout jerks, more so than the simple buds on other models and especially the collar-style phones. Included with the Kicker are the usual small, medium and large silicon tips; other fancier phones may include a wider material (i.e. foam) and style selection, but in many cases this is overkill. The in-ear tubes are slightly angled from the exterior hard-plastic black bud to ease insertion and enable hours-long comfort. Again, this comfort is a subjective judgment; with large canals, I admittedly tend to have a high in-ear tolerance level. The crescent 4 x 3 x 1.5-inch zippered case is eminently pocketable for portage. Ergonomically, we wish the Kicker cord were a bit longer or had buds that magnetically attached to each other so they could stay more steadfastly across our clavicle when not in our ears. The in-line mic should hang a little closer to our mouth than up behind the jawbone. And, the buttons on the in-line controls should be a little easier to discern and differentiate by feel. But these are merely quibbles that in no way detract from either the user experience or the performance of the Kicker. At 8 hours of music-listening time, the Kicker EB300 doesn't provide the 9 to11 hours of the collar-type earbuds, but do provide more than the 4-6 hours of the other cord-based behind-the-neck models. So they should cover even the most-delayed back-and-forth commuting and workout grooving. The Kicker EB300 is our top Bluetooth earphone pick because our music listening and conversational situations are always variable. While many of the other phones might have excelled at one aspect or another, they also failed in one aspect or another. The Kicker EB300s were the only headphones we tested that ranked at or near the top in ergonomics and sound-quality, making them the most suitable for the widest range of usage situations. These are our go-to Bluetooth in-ear headphones. Here are our picks for the best Bluetooth phones to satisfy more specific listening needs. These in-ear phones are, by several orders of sonic magnitude, the best-sounding, most audiophile wireless phones we've ever stuck in our ears – their audiophile attributes challenge similarly-priced wired models. You get an overall airier sound, with more separation, a wider soundstage with more natural, not pounding, bass, than any of the models we listened to. One music-listening drawback: the NuForce BE6 needed a slightly higher volume setting to achieve full clarity. Conversationally, however, the BE6's audio wasn't wonderful. Conversations were often a bit more muffled and hollow than we expected with slight variances in volume and inconsistent noise reduction, although background noise was absent most of the time. But when they sounded good, in optimal ambient environments, the BE6 sounded, like music, above average. Ergonomically, their buds conveniently magnetically stick together to form a necklace that helps prevent loss when they're not in your ears. One major drawback: the BE6 last only up to six hours for music listening and aren't sweat/water resistant so aren't exercise-appropriate. 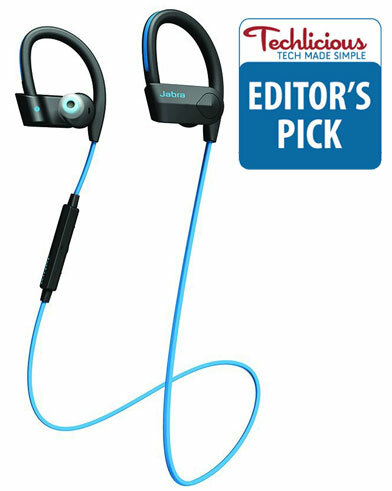 The music playback presence, soundstage and clarity of these exercise-centric over-ear hooked phones rank behind only the Optoma NuForce BE6 and the LG HBS850, lacking only some "presence" brightness and the boomy bass that often fuels workouts of these other two alternatives. What sets the Pace apart is real-time audio coaching via Jabra's Sport Life app. When you set up workouts, voice prompts help you reach and notify you of distance, calorie or burn targets, to reach and maintain a specific workout pace or create your own interval training workout, as well as the 12-minute Cooper test progress and results. The app also historically tracks duration, pace and calorie burn so you can measure your workouts over a period of time, helping you reach achievement goals. You can map your running route as you run it with updated time and distance stats, and you can even play your music through the app. Ergonomically, the Pace hooks lightly but securely and comfortably, albeit not as lightly, securely and comfortably as the Kicker EB300’s, over the ear, and the angled buds slide easily into your ears. Both sweat- and rain-resistant (IP54 rated) they will survive the nastiest of workouts as well as a light liquid cleansing, but not dunking. Unfortunately, you get just a short 5 hours of battery life for listening and conversation, which should be plenty for getting to and from the gym with your workout in the middle – but not much more. Delivering the highest-quality sound – and the most volume and most solid, but not overwhelming, bass – of all the Bluetooth phones we tested other than the Optoma NuForce BE6 are these rubbery around-the collar phones from LG, which created this form factor. For cellular calls, the Tone Actives also offer the best noise-cancelling capabilities for conversation we experienced, which means hearing your clients over the hubbub of a busy airport hub won't be an issue. You also get IPX3 water and sweat-resistant, the HBS-850’s cling tighter around your neck so they don't bounce around like other collar-styled phones during workouts, but can feel constricting over time. For serious fitness buffs, the HBS-850’s lack the workout support of the Jabra Pace. When you're not listening or conversing, the HBS-850 ear buds spring-retract into the collar ends so there are no dangling cables to get caught in zippers. One other drawback is their seasonality. Like most collared-styled phones, the HBS-850’s are awkward to wear when even moderately bundled-up for winter. But what you get, which few wireless earphones deliver, is very high-quality music sound, excellent noise-cancelling and call quality and a well-above average 9.5 hours of hands-free music listening and chatting. We tested more than a dozen Bluetooth earphone models; here's a brief rundown of the best-of-the-rest, considering sound quality, at least 7 hours of music-listening battery life and special attributes. Jabra Sport Pulse ($118.99 on Amazon): Voice "coaching," biometric tracking, water/sweat-resistant, expensive. JayBird X2 ($149.00 on Amazon): Great audio and bass, water/sweat-proof; pricey compared to other more capable choices. LG Tone Pro HBS-760 ($45.02 on Amazon): Budget price, decent sound, 11 hours music; not weather/sweat-resistant. LG Tone Ultra HBS-800 ($49.99 on Amazon): Good noise-elimination, 10 hours music; weak bass, not water/sweat-resistant. LG Tone Infinim HBS-900 ($89.99 on Amazon): Harman Kardon sound, snap-retractable buds, 14 hours music; not water/sweat-resistant, pricey. Motorola Surround ($33.99 on Amazon): Great conversation sound, water/sweat-resistant, 12 hours music; music lacks bass "oomph." 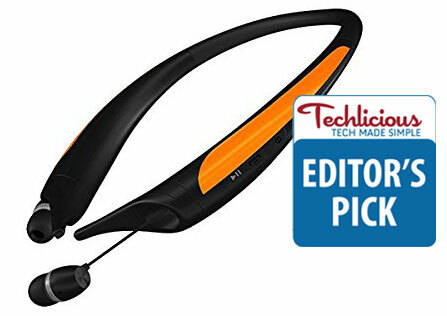 Plantronics BackBeat Fit ($77.99 on Amazon): Airy aural quality, water/sweat-proof, 8 hours music; poor noise reduction. 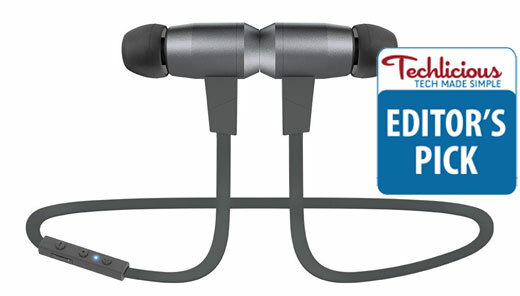 Samsung Level U ($53.96 on Amazon): Deep, solid base and decent sound; loose-fitting buds, not sweat-proof. Sol Republic Shadow ($99.99 on Amazon): Flexible collar, solid bass, 8 hours music; not sweat/water-resistant. You really have a great list of best headphones. I have been loving this site after i came to know about it from search. I am in the process of buying a good headphone and will choose one after checking them all. BTW, Thanks a lot for this great info. I love these reviews, they are probably the most extensive and informative reviews out there and I really appreciate the hard work. Second, noticed the jay birds (X2) price dropped to 99$ in some retailers like amazon and bestbuy. Does the recommendation for the jlab’s over the X2’s still apply? third, i’m a bass lover, and i saw some reviews like the one from http://www.headphonesunboxed.com/ mentioning the bass lack a bit of an oomph to it. so I would love to know which ones bass is better. many thanks. I am trying to find a pair of these for hubby for Christmas - he mentioned he thought Bose would ‘probably’ be the best - yet they are not even listed. Were they just not included in this research? Look forward to a reply. Thanks! !